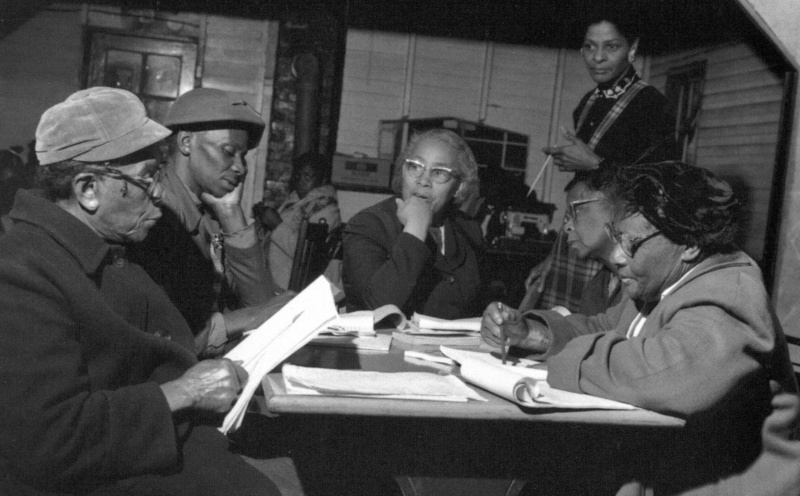 After being fired from her job as a teacher for refusing to renounce her membership in the NAACP, Septima Clark became the Director of Education at the famous Highlander Center in Tennessee—a training school for civil rights activists and trade unionists. There, she began her work of establishing “Citizenship Schools” to teach literacy to and politically empower African-Americans in the South. These schools not only educated people in response to racist voting registration laws that included literacy tests, but became a core network from which to recruit leaders for the civil rights movement. Ultimately, the program became so large that it was brought under the Southern Christian Leadership Conference (SCLC) and trained more than 10,000 teachers to lead citizenship schools throughout the South. Hundreds of thousands of men and women registered to vote as a result. At that time I was very nervous, very troubled in my mind about the events that were occurring in Montgomery, but then I had the chance to work with Septima. She was such a calm and dedicated person in the midst of all that danger. I thought, “If I could only catch some of her spirit.” I wanted to have the courage to accomplish the kinds of things that she had been doing for years. Parks returned from Highlander to Montgomery having gained from Clark a newfound sense of conviction and self-confidence—and used it to step into history. This entry was posted in Uncategorized and tagged 1950's, 20th Century, African-Americans, Civil Rights, Democracy, Education, Rosa Parks, Septima Poinsette Clark, USA, Voting Rights, Women. Bookmark the permalink.